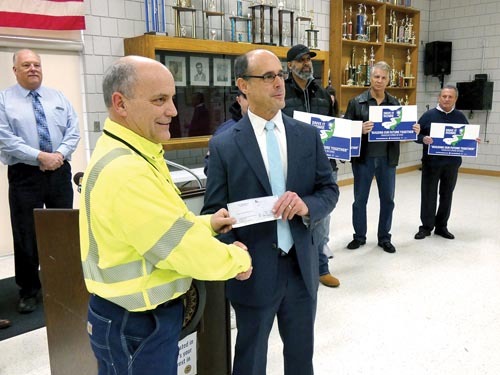 Drew Schneider, left, plant manager at the new Lordstown Energy Center, a $900 million natural gas-fired power plant, presents Guy Coviello, president of the Youngstown Warren Regional Chamber Foundation, right, a check for $15,000 to be used to help fund the Drive It Home Ohio campaign. The campaign is a local grassroots effort to persuade General Motors to reinvest in its Lordstown plant and grow jobs there. The money was given Friday at the United Auto Workers Local 1112 hall in North Jackson. This is the first substantial contribution to the campaign. Tribune Chronicle / Ron Selak Jr.
NORTH JACKSON — Managing the grassroots campaign to convince General Motors to keep producing a vehicle at its plant in Lordstown is going to take money, and probably a lot of it. “People want yard signs, social media is not for free,” said Dave Green, president of United Auto Workers Local 1112, whose members, along with management at the facility, will be idled March 8 after the automaker announced in November its intention to place the plant and four others in North America on “unallocated” status. And now the effort to fend off closure and get a new vehicle has been boosted with $15,000 from the Lordstown Energy Center, the $900 million natural gas-fired power plant that opened earlier this year within a couple miles of the GM complex . The money is the first substantial donation made to the Drive It Home Ohio campaign — the effort to convince GM to keep the plant operational and grow local jobs. It will be used on signs and possibly to hire someone for media and marketing, Green said. LEC plant manager Drew Schneider presented the check Friday to coalition members, including the Youngstown Warren Regional Chamber, village Mayor Arno Hill and Local 1112 members, at the hall in North Jackson. 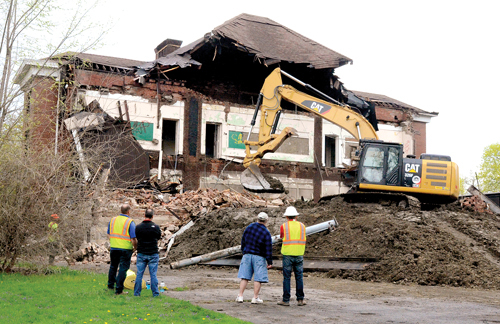 “We appreciate the Mahoning Valley’s support for LEC’s development, construction and startup, so we’re very pleased to support this community initiative,” Schneider said. There has already been lesser donations — between $2,000 and $3,000 — for the campaign and some in-kind donations, like signs. The money from LEC, officials said, is hoped to set the example for other funds for the campaign. But the effort doesn’t stop at GM, although the company is the No. 1 target. “The message is also possibly putting out to potential people who might want to buy or lease the facility. There is a community here that is willing to work with you, a community that has a workforce ready for you, is very experienced and very talented,” said Guy Coviello, president of the Chamber Foundation. “We know people are watching this, so we are doing the best we can to put out a positive, proactive front,” Hill said.